The prolific Collins (Ask Not, 2013, etc.) finds veteran gumshoe Nathan Heller in the McCarthy era, when Wisconsin’s demagogue senator looked for a Commie under every bed and his counsel Roy Cohn manipulated the Rosenbergs into the electric chair. Read this one as two novellas, loosely connected by McCarthy’s appearance. The senator summons Heller to Washington while noted author Dashiell Hammett takes the Fifth at a Senate hearing. Later, Hammett hires Heller to conduct "an eleventh hour investigation" into the Rosenbergs’ case. McCarthy—"big off-white smile blossomed in the blue-jowled face"—wants to stick his nose in the atomic-bomb spy case, too. With that, and bringing in an interesting cast of real-life characters sure to be familiar to baby boomers, Collins offers another homage to the noir detective genre, albeit laced with post-Vietnam/Watergate knowing cynicism. Book 2 festers with nuclear-age conspiracies and the CIA running amok. Institutional paranoia has the spooks conducting LSD-25 experiments on its own people, and innocent civilians, while using the mob for a bit of wetwork. 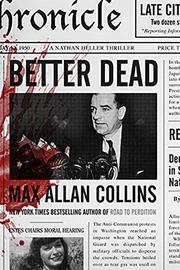 There’s a tenuous link between the two books—Heller’s hired to pry McCarthy’s file from the CIA in Book 2—but Collins generally navigates that tightrope fine, all while keeping both plots logical, the pace electric, and scenes powerful—Nate’s observation of an LSD–induced suicide is cringe-inducing. Characters real and imaginary are believably sketched, and Collins’ take on 1950s New York City, especially Greenwich Village—dancing at the Village Barn, breakfast at the Waldorf Cafeteria—is impeccable. Veteran author Collins knows detective novels work best when there’s a rugged, flawed, self-aware sleuth, a shades-of-gray atmosphere, a righteous quest, and a bed-ready damsel, Bettie Page filling the bill here.